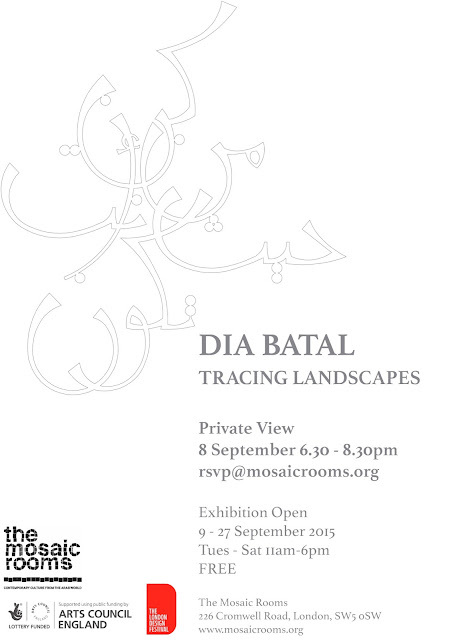 'The Mosaic Rooms present a special exhibition of new multimedia works by spatial designer Dia Batal for London Design Festival. Batal uses the art of Arabic calligraphy to transform text into objects, which seek to engage audiences in contemporary issues of identity and belonging. In this exhibition, Batal not only re-envisions this traditional art but also conventional architectural forms and objects. Suspended in front of one of the gallery windows, the designer has created a Mashrabiya, a window screen customarily wooden and ornamental in form. The designer’s fragmented interpretation is designed to act as a memorial for the Palestinian children killed by Israeli strikes in Gaza in summer 2014. Playing on the Beach is a Dangerous Course features embroidered panels, using cross-stitch traditional to Palestinian embroidery, with the individual names of 30 victims taken from the records of the over 500 deceased. Dedicated to the four boys killed on the beach, the piece examines shifting rituals and mourning spaces in times of conflict. Tactile, delicate, and ephemeral, subject to temporal changes in light and shade, this impermanent commemoration creates space within a threshold, a possible place of remembering. Ideas of home and belonging are looked at in two new pieces in metal. Using text taken from the poetry of Mahmoud Darwish, Batal explores the meaning of place in an age of migration and immigration, of moving here but coming from there. One work draws inspiration from navigational tools such as compasses. She creates an object that points to home, a device to determine a psycho-geographical direction, a bearing full of both intent and longing. Through the artworks, home is also signified as an internal orientation, one that we guide to remain on our own course of belonging. This is further examined in the new multimedia work done in collaboration with Maya Chami, in which the story of Batal’s grandmother is unfolded through the fragmented narratives of a journey of displacement. Forced to leave her home in Palestine, and never able to return, this is an emotive animation that examines the significance of involuntary departures from a homeland, and how and where the idea of home can remain after such conflict. *Please note the exhibition will also be open 11am-6pm 20, 21 and 27 September as part of The London Design Festival.